It’s always interesting when your travels take you somewhere which doesn’t turn up on an internet search. In English at least, there’s probably lots to be said about Ebao (or E Bao or Ebuzhen) in Chinese. 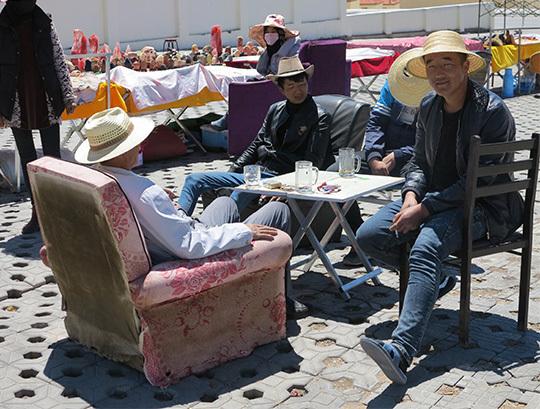 We stopped for lunch in Ebao on Day 47 of my recent Silk Road Bangkok-to-London drive. 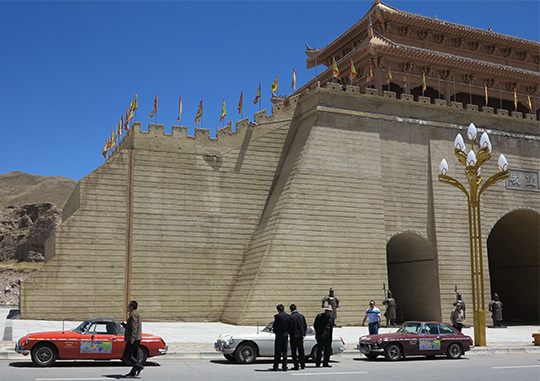 It’s half way along the 336km drive from Xining in Qinghai Province to Zhangye in Gansu Province. We followed G227 between the two cities and Ebao (as it was identified on my German Reise Know How 1:2,700,000 China West map) was where the S304 road merged with it. On Google Maps it’s at 37°58’05.0″N 100°56’09.1″E although it’s identified as Ebuzhen. ◄ You can see this large building on Google Earth at that location, still under construction. ▲ Here’s another view of it, from the front with my MGB and a couple of others parked by the roadside. 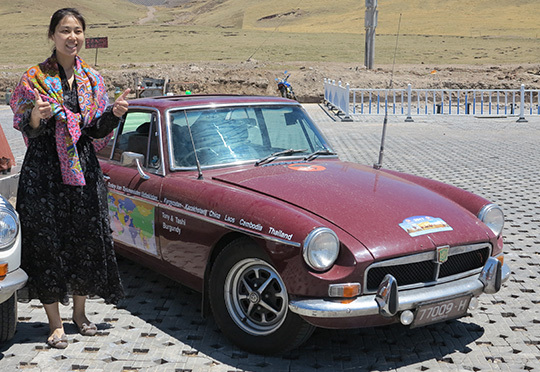 ▲ Of course our arrival prompted lots of photo opps for Chinese tourists like this young woman in front of my car. ▲ We were all part of the passing trade for local souvenir sellers. ▲ There was a lot going on in Ebao although we really didn’t learn much during our short stop. The Ancient City Museum wasn’t open and I can’t find anything online about it. ▲ Another Silk Road monument, with our MGBs lined up in front of it, rather like the one we’d seen as we left Xian just a few days previously. 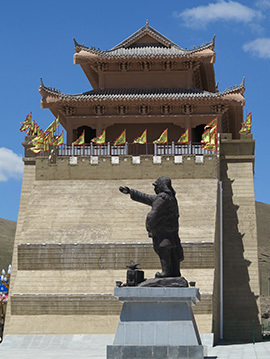 Xian is said to be the official starting point of the Silk Road, if you’re travelling west like we did. 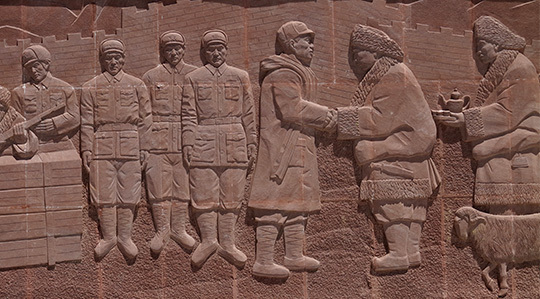 ▲ Or this bas relief of more recent events. I still don’t know much about Ebao (or E Bao or Ebuzhen). It doesn’t feature in Lonely Planet’s China guide, if you search on the internet blogs from our MGB party will probably pop up more than anything else although I did find this Göteborg (Sweden, aka Gothenburg) to Bangkok cycling trip report on Ebuzhen. We’d passed through the Dabanshan Tunnel shortly before reaching Ebao and that certainly makes an appearance, including stories on the difficulties of constructing tunnels in regions of permafrost, but don’t confuse it with another Dabanshan Tunnel, built for a high speed rail line. 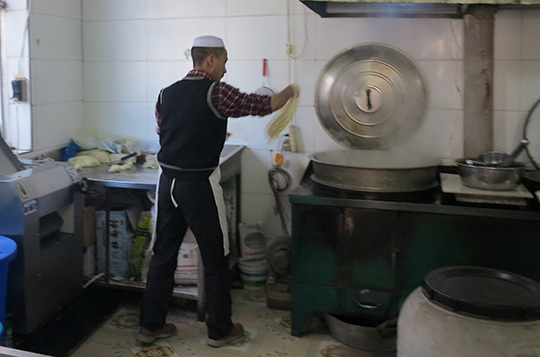 ▲ Our stop in Ebao did feature noodles – here being hand thrown – in a local noodle shop.